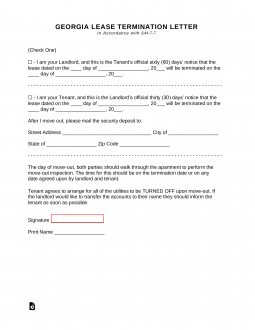 The Georgia Termination Lease Letter Form will satisfy the legal notice requirements when it is time to end a lease with no fixed term. That is, when a landlord or tenant wishes to terminate a month to month lease of any sort, the State of Georgia requires that whichever party has decided to end the arrangement must give written notice. Laws – § 44-7-7 – Landlord must provide at least sixty (60) days’ notice and the tenant must provide thirty (30) days. The reason for springs from the necessity of making sure the remaining party is not taken by surprise which may result in financial difficulties. The reason is simple. A rental agreement involving a living situation has a dramatic impact on the life of a tenant and the finances of the landlord. This is why the number of days’ notice required will depend upon the party wishing to terminate. A tenant must receive sixty days’ notice since that individual must find a new property to maintain a residence. This may require certain considerations for the tenant (i.e. they may require being in a certain area for professional reasons). Thus, the tenant is entitled to sixty days’ notice from a landlord wishing to terminate the agreement. A landlord is entitled to thirty days’ notice as this entity does not need to go through the physical difficulties of locating his/her personal possessions and will remain in the same area as before. Step 1 – Check the first box then enter the date of the lease being terminated and the date it shall be considered terminated. Step 2 – Sign and print your name at the bottom of the page. Step 3 – Make sure the tenant receives this document a full sixty days before the date of termination. Step 1 – Check the second box then enter the date of the lease being terminated and the termination date itself. Step 2 – Next enter the street address, city, state, and zip code where you may receive your security deposit. Step 4 – Send this to the landlord with enough time for receipt of this document to remain in accordance with providing thirty days’ notice. That is, the landlord must have this document in his/her hand thirty days’ before the termination date listed in the second paragraph.